On the 12th of October, IMADR presented the situation of racial discrimination in Japan at the 28th UPR pre-session organised by UPR Info. 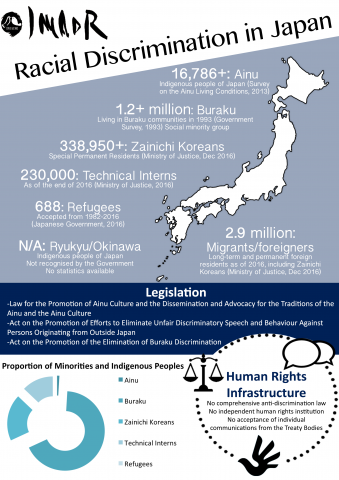 It raised a number of human rights concerns namely on: the lack of human rights infrastructure against racial discrimination; racist hate speech; discrimination against minority communities including Buraku and ethnic Koreans; multiple forms of discrimination; and human rights violations in the foreign “Technical Intern Training Program”. While recognising several positive steps taken by the Government of Japan, it called on States to make recommendations specific to racial discrimination at the UPR 28th session in November this year. In the concluding remarks, IMADR stressed that Japan, a Member State of the UN Human Rights Council, has the capacity to take measures to improve the human rights situation in the country.